AURORA, IL--(Marketwired - Apr 1, 2015) - BERNINA of America, the premier manufacturer of sewing, embroidery and quilting machines, is pleased to introduce its next generation 7 Series machines, the BERNINA 790 (B 790), BERNINA 770 Quilter's Edition (B 770 QE) and BERNINA 740 (B 740). The new machines offer cutting-edge technology, up to 10 inches of space to the right of the needle, and the new BERNINA Hook System with 9 mm width to provide superior stitch quality at up to 1,000 stitches per minute. They also feature a new user interface with onscreen help, innovative functions like BERNINA Adaptive Thread Tension for perfect stitch quality front and back, and a fresh selection of stitches and embroidery designs. The next generation 7 Series machines are available at authorized BERNINA Dealers nationwide. "The next generation 7 Series includes BERNINA's best and latest features for sewing, quilting, and embroidery," said Paul Ashworth, President of BERNINA of America. "These machines are designed for sewists who demand quality and the technology to explore their full creativity." The new BERNINA Hook System features a robust metal hook and a Jumbo Bobbin. The bobbin case is constructed of high-quality synthetic material reinforced with fiberglass, offering impact resistance and high stability during long runs. The new BERNINA Hook System is exclusive to the next generation 7 Series and is not compatible with previous model 7 Series machines, which include the BERNINA 710, BERNINA 750 QE and BERNINA 780. Users will also appreciate the built-in BERNINA Dual Feed, slide-on extension table, high penetration power, and the ability to import and export stitches via USB. Additionally, the next generation 7 Series machines come with the BERNINA Free Hand System (FHS), which allows hands-free raising and lowering of the presser foot as well as lowering of the feed dogs, and a selection of full shank BERNINA presser feet to fit their sewing, quilting and embroidery needs. The BERNINA 770 Quilter's Edition (QE) is a sewing and quilting machine with an optional embroidery module. It comes equipped with a 4.3-inch high-resolution color touch screen, an updated user interface, and a programmable foot control. The B 770 QE also features the BERNINA Stitch Regulator (BSR) and BERNINA Patchwork foot #97D, along with 327 stitches, 50 quilting stitches, and enough memory storage for four personal programs. 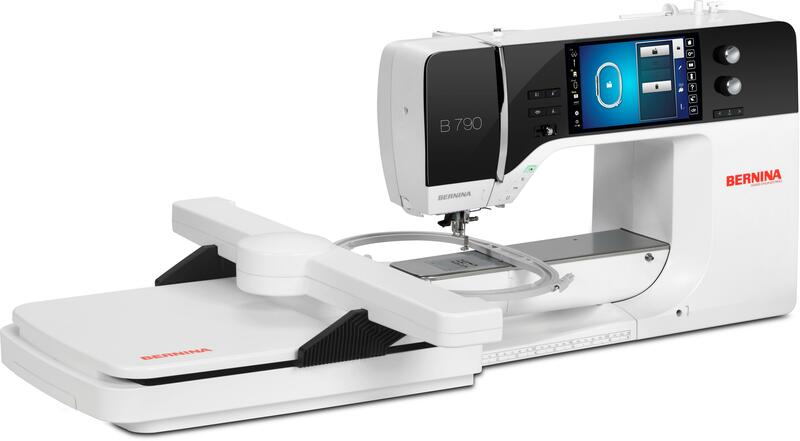 The BERNINA 740 is a sewing machine packed with BERNINA's best features, including an updated user interface and a 4.3-inch high-resolution color touch screen that shows stitches on screen in actual size. Additionally, the B 740 comes standard with five full shank BERNINA presser feet, 241 stitches, and memory for four personal programs. It's also compatible with the BERNINA Stitch Regulator (BSR). For more information about the next generation 7 Series, please visit www.bernina.com/7series. Founded in Switzerland more than 100 years ago, BERNINA is the world's premier manufacturer with a proven reputation for offering quality state-of-the-art sewing, quilting and embroidery machines, overlockers/sergers, and embroidery software. BERNINA's leadership is marked by an impressive number of ambassadors, industry leaders, influencers and bloggers, who chose to partner with the company. BERNINA products are sold in the United States through a network of over 400 fully trained independent dealerships that also offer support and education. Select BERNINA and bernette machines, and BERNINA software can also be purchased through BERNINA's eCommerce site, shop.bernina.com. BERNINA products are designed for beginning to advanced sewists and priced to meet a variety of budgets, with new products being introduced every year. You can follow BERNINA on Facebook: www.facebook.com/berninausa, Instagram: @BERNINAUSA, and Pinterest: www.pinterest.com/WeAllSew, and read BERNINA's WeAllSew blog at www.weallsew.com. To learn more about BERNINA and to find a Dealer, visit www.bernina.com or call (630)978-2500.